Kralupy is very close to Prague 6 and nearby villages such as Horomerice, Velke Prilepy, Cerny Vul - popular localities for expats to settle in. 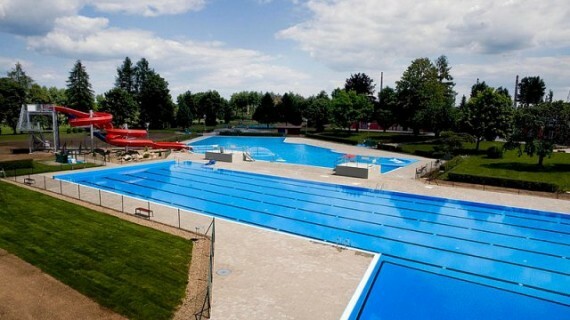 Route Planner says it is 31km away from Prague’s city border, so this is most probably the closest outdoor swimming place (koupaliste in Czech) for people in this area. Surprisingly it’s a very nice swimming complex providing a better experience than most of Prague’s swimming pools. It has recently undergone major reconstruction and the results are great. We live at Prague 5 and it took us just 25 min by car to get there. This place and Kladno are now our favourite swimming places. If I compare it to Kladno outdoor swimming complex then this one in Kralupy is 1 level up. The swimming pools are covered with a soft rubber like surface, its more modern and the outdoor garden has more shade under the trees. Don’t be put off by the pictures. We went there on the hottest day so far this summer (2013) when everybody sought relief near water - and it was the weekend! I spoke with one local mother and she said it is actually very nice and not crowded during weekdays. The watersides are 70m long and end up in a huge pool that only has a depth of about 50cm of water - perfect for smaller kids. There is a small paddling pool for toddlers and also a big pool for swimmers with a jumping tower - a high jumping tower! It was hilarious to observe some of the jumpers :-) some of their creative dives could possibly make it at the Olympics :-) The depth underneath the tower is about 10 m. Wow! Parking: There is a big parking lot next to the complex on the grass. Although people were parking everywhere on the main road. It is important for a newcomer to know that you can only park on the right side of the road heading away from the main entrance. Lots of cars were parking on the left side and they all got ticket, because it is a 2 way street and at the end of the road there is a no parking sign which you cannot see at first glance and because cars are parking on both sides you assume it is a one way street. We only found out because people were discussing it in the queue. Then when we left the pool, all the cars on the left had a ticket under their wipers. Municipal Police had a harvest that day….! Food: Well, its a disaster - bring your own food. There are 2 restaurants - kiosks with one owner, which I think isn’t very smart for the quality of service. That day we experienced 45 min queue for one hamburger. I wasn’t impressed at all and Thank God I made home made schnitzels for the boys. One lady told me her husband couldn’t resist the kiosk and had a Hamburger 3 days earlier and since then he has been in bed with stomach flu. How disappointing. Sure - drinks and packed products are fine, but I wouldn’t go for anything they cook. What a shame. Such a nice place and the food is crap. I was nicely surprised by a fresh drinking water fountain for everybody. Marked: “pitna voda” that way you don’t have to buy water at all. It is right next to the showers. The other ones are marked: “uzitkova voda” which means - normal usage water. There is a playground with rubber surface which is very well thought of considering the the kids are half naked. Within the complex they also offer some attractions like a bouncy castle and mini electric car rides - but you pay extra for that. They also offer a beach volley ball sand court for free.